TripAdvisor: One reviewer, 'unclegus', has posted almost 20,0000 times. TripAdvisor's most prolific user, UncleGus. With 19,356 contributions to the website in just over a decade, “Unclegus” is clearly not your average TripAdvisor user. Such dedication has earned the Edinburgh resident – who asked to remain anonymous – the title of TripAdvisor’s most prolific UK reviewer for 2014 – 607 in total, to go alongside numerous forum posts and photographs. This year he has shared his wisdom on British destinations including Bristol, Manchester, Glasgow and Liverpool, while the Czech Republic featured in hundreds of reviews. In November alone, he rated 95 attractions, restaurants or hotels in Prague, awarding a pitiful rating to Lennon Wall (“gets worse every time I see it”), but recommending the city’s cemetery and Letna Park, among others. So thorough is his coverage of the Czech capital, not to mention his native Edinburgh, he clearly spends much of his time scribbling into a notebook. Which begs the question – why? "I wanted to see how many I could do in one year if I reviewed everything I possibly could,” he explains. “It's been a massive effort and not one that I am going to continue – it takes up too much of my free time." Unclegus believes there’s far more reliable advice to be found on TripAdvisor’s destination forums – the “beating heart” of the website, he says. And those 607 reviews pale into insignificance compared to his forum contributions – which number several thousand in 2014. But he’s not the most prolific TripAdvisor member when it comes to total contributions. “LellyCaw1” pipped him to that title. She has left just 44 reviews since joining TripAdvisor in 2011, but has posted almost 20,000 messages on its forum, including 7,613 nuggets of advice this year. That figure includes 150 posts about Disneyland Paris since December 8. Thread topics include “Disney Store Princess Dresses” and “Queue system for Frozen”. Other prolific users include Steve Jackson, 49, from Gateshead, who posted 1,587 photos in 2014, the most of any UK user, and more than half of his total contribution of 2,903 images. “I suppose that puts me down as a bit of a sad person”, he chuckles. But he believes traveller photos such as his are a vital tool for visitors to the website. “The professional photos may look great, but is that what the place really looks like? They may not show the dark and dingy corridor, for example,” he said. He added that he does not trust every review, but works on averages, and finds reports from other British or northern European users most reliable. 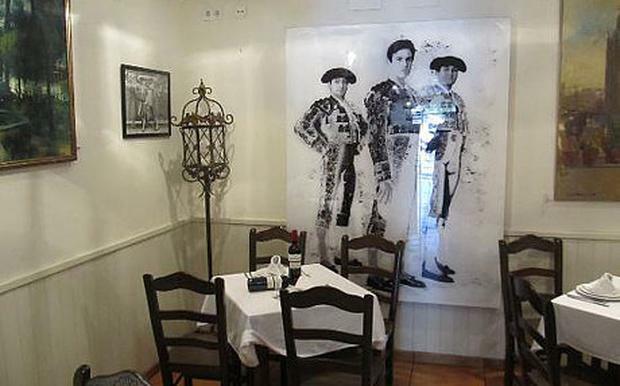 Jackson says he photographs "what other people see", like at this hotel in Seville. Showing an addiction to TripAdvisor that some might find extreme, he says that he got “seriously into it” in 2012, although he has been a member of the site since 2008. Overall, he has written 394 reviews of hotels, restaurants and attractions from TGI Friday’s in Gateshead to the Thang Long Water Puppet Theatre in Hanoi. He does not travel with a smartphone but takes all his pictures with a normal camera and then posts his reviews and images on his return home, uploading five to 10 a day over the course of several months. He awarded his worst review to the Patpong Night Market in Bangkok, where he was “disgusted” and “saddened” by the sleaze. He also had plenty to say about last month’s high-profile incident, when a Blackpool hotel fined a couple £100 for writing a negative review. 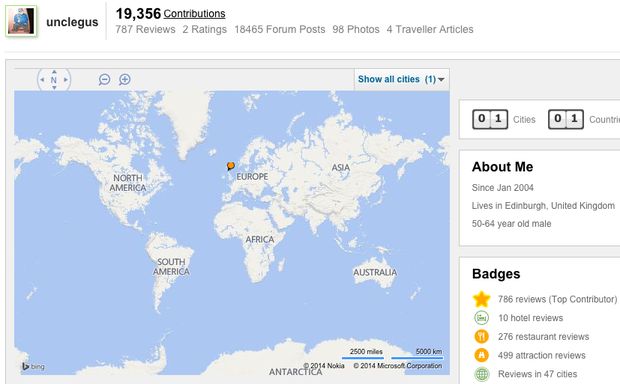 “I think TripAdvisor should remove places like that from its site,” he said. Whatever your opinion of posters like Jackson, their dedication is surely preferable to the dishonest reviews that many – like unclegus – believe spoil the site. TripAdvisor has endured several controversies over the years, from the hotel executive caught writing glowing reviews of his own proprtties – and negative ones of his rivals - to this year’s discovery of of suspicious Chinese reviewers – one of whom claimed to have visited 51 hotels in Paris (and 50 in several other countries) in a single month. And if they keep on posting so thoroughly, there won’t be many streets, shops – or indeed pub toilets – left unrated before long.